A few weeks ago, I was attending a concert with the person that runs this site and we ran into a guy who was a huge progressive rock fan. We struck up a conversation while a video of Yes from the “90125” tour was playing on a nearby video screen. Things got awkwardly silent. I had heard the album via a stream that was sent to me by the publicist, and loved it, and at that moment, I began to feel very sad that the album had been compromised. So rather than support someone seeking it out before it has been released, you now have the opportunity to buy “Toto XIV”, and I am going to tell you why you should. It’s no secret that the heyday of any form of rock music is long gone. The bands that were inspired by four kids from Liverpool England reigned supreme for years, but today’s music industry giants are created and marketed. Their songs are crafted and polished, tested, and mostly streamed, not owned. Streaming has changed everything. It has not just damaged some artists’ bottom line; it has changed the relationship between the musicians and their fans. When you bought an album, you owned it for your listening pleasure. In order for you to plunk down your hard earned money, it had to be good, and if it wasn’t, you felt cheated. If “Toto XIV” had been released before there was streaming and downloading, you would not have felt cheated. It would have been the album you played for your friends when they came over for a smoke and a beer. It would be the album you would introduce by saying, “dude, you have got to hear this album, it’s (bleeping) amazing!” They would agree. “Toto XIV” is the product of a band that has faced its trials and tribulations. Losses due to strife, illness and even death. What remains is a solid unit, and unlike many bands who never seem to return to their former glory after the “classic” lineup dissolves, Toto’s current lineup is arguably their best, both live, and as “Toto XIV”, proves, in the studio as well. 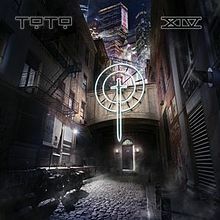 Even though I am fortunate enough to receive more than my fair share of new releases, I bought “Toto XIV.” After hearing the stream, I wanted to own it, and I wanted to support the band by owning it. In some ways I felt that by purchasing this album, and helping it chart, maybe other artists that I love will make albums that are this good, instead of just fading into the sunset as an oldies band that happily lives on the casino, rock cruise and festival circuit. As the proud owner of “Toto XIV”, I can say with confidence that the songwriting, singing, and playing is breathtaking. There is no filler, and it does not sound like a band that has taken their old material and moved things around, and yet it contains all the elements that made Toto international superstars. Most importantly, it is a full band effort. Sure, they have some impressive guest musicians, but at their core Toto is still a group of musicians that chased the dream that so many kids did after seeing their favorite rock band. By purchasing their latest album, or any great album by a band that you love, you still can share in that dream for as long as you own it, not just until you lose your internet connection. Michael McDonald, Amy Keys, Mabvuto Carpenter, Jamie Savko, Amy Wlliams – background vocals.